Born Eveline Jessie Dobell in Gloucestershire, England, poet Eva Dobell was the daughter of wine merchant and local historian Clarence Mason Dobell and the niece of Victorian poet Sydney Dobell. 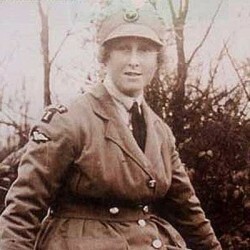 She volunteered to join the Voluntary Aid Detachment (VAD) as a nurse in World War I with other women of note such as Enid Algerine Bagnold who later wrote “National Velvet” and Vera Brittain, British author of the best-selling 1933 memoir “Testament of Youth” which recounted her experiences during World War I. The VAD referred to a voluntary unit providing field nursing services, mainly in hospitals, in the United Kingdom and various other countries in the British Empire. Eva Dobell was deeply distressed by the suffering and loss of life she observed during her work with the VAD during the war. Her experiences moved her to take part in the morale-boosting work of writing to prisoners of war and prompted her to write poetry about, among other things, wounded and maimed soldiers. The major part of her life was later spent in the English Cotswolds, but she also travelled extensively to Europe and North Africa. She helped and encouraged young poets, and campaigned for the protection of both wildlife and the English countryside. Her poem “Night Duty” is cited as one of many poems by female war-poets and nurses that provide access to an experience rarely shared by male poets such as Wilfred Owen and Siegfried Sassoon. Only the Sister’s candle softly beams. As those bright worlds thick strewn ion that vast depth of sky. This entry was posted in Inspirational, Women and tagged author, First World War, herstory, inspiration, Inspired by my mom, inspiring story, nurse, nursing in wartime, poet, Remembering the Great War, The Great War, VAD, wartime, Woman, Woman in wars, World War 1, WW I. Bookmark the permalink.